Abstract: Offshore wind is a relatively new industry and it is generally more expensive to generate than many alternative renewable sources. Operation & Maintenance (O&M) makes up a significant part of the overall cost of running Offshore Wind Turbines (OWT). The complication of O&M lies in that its responsibility has been split between turbine manufacturers, wind farm operators and the offshore transmission owners. This has inevitably led to areas of inefficiency, duplication of effort and lack of information. Big data analytics is one great technique that will drive future growth. It would offer three huge benefits that can transform an industry in terms of visualization of real time data, development of decision support tools based on disparate data sources, and data mining to aid planning and find performance inefficiencies to improve real-time operations. 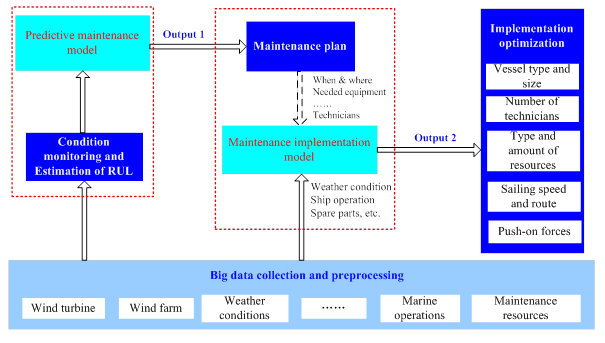 In this paper, an integrated operational system of offshore wind farm is proposed deploying big data analytics. Firstly, the current state of the O&M of offshore wind farm and the big data analytics are introduced. Afterwards, a predictive maintenance model and a maintenance implementation model are proposed, and an integrated operational system is developed incorporating those two models in order to optimize maintenance planning and implementation. Finally, The possible contribution of such a system to a more effective O&M of offshore wind farm is discussed. Reference: K. Wang, X. Jiang, X. Yan, Y. Yuan, R.R. Negenborn. Development of an integrated operational system to reduce O&M cost of offshore wind farms based on big data platform. In Proceedings of the 4th International Conference on Maritime Technology and Engineering (Martech 2018), Lisbon, Portugal, pp. 469-474, May 2018.